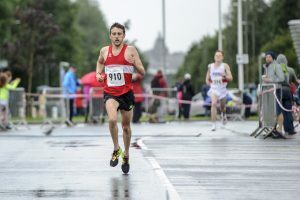 All roads led to Stirling on Sunday where the Scottish 10K Road Championship Event was being held. 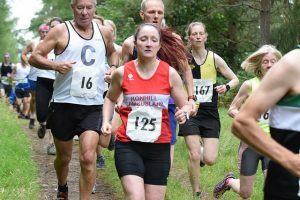 The race continues to grow in terms of popularity with over 1,000 runners having entered including 25 from Cambuslang Harriers. Pre race hopes were high that Grant Sheldon and Masters Robert Gilroy and Kerry-Liam Wilson would be in the battle for a podium place in their respective age categories and that the senior/masters men’s team would also feature among the medals. The individual and team results proved to be even better than Cambuslang could have expected as Grant won the Scottish senior title from Logan Rees of Fife AC and Lachlan Oates of Shettleston Harriers, Robert and Kerry-Liam Masters gold and silver and the team courtesy of Grant, Robert and Craig Jardine captured team gold ahead of Fife AC and Shettleston. Although Erica Christie was the first female over 60 there was no national medal up for grabs. This was the club’s 3rd team victory in this event along with 5 silvers and 3 bronze medals while Grant followed in the footsteps of previous club winners Stevie Wylie, Wegene Tafese and Josh Lilly. Team victory too meant that Cambuslang had won both national trail and road championship titles in the space of 8 days and that Robert was a double Scottish Masters champion. 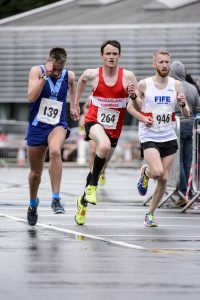 The Stirling course has a reputation for producing fast times and this was the case again this year in spite of wet and windy conditions. 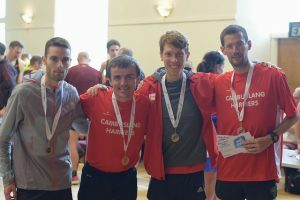 Both Grant and Craig recorded pbs as did Kevan Harvey, Colin Reilly, Shaun Butler, Fraser Stewart and John Paul Murphy. 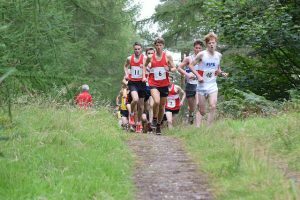 Cambuslang showed strength in depth by having 8 men in the top 40 with 8th placed Gordon Robertson clocking a very respectable 33.29. Another 10 runners dipped under 39.18 in the order of Fraser, Justin Carter, Richard Carr, Michael Barker, Tony McCutcheon, Iain Nicholl, Paul Kernohan, John Paul, Simon Gold, Scott Hunter and Dan O’Connell with Kenny Finlayson just over the 40 minute mark. Sandy Eaglesham recorded a fine 42.36 in the over 60 category. Both Jennifer Reid and Erica Christie who won Scottish Trail Team bronze medals last week ran season best times of 41.11 and 41.54 with Lesley McArdle and Paula McCabe not too far behind them. 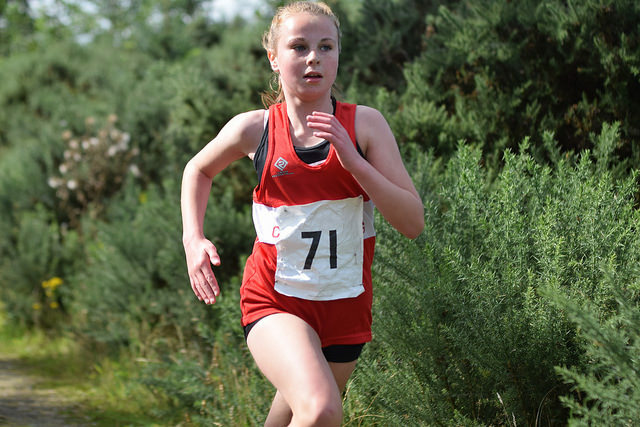 Millie Nicholl also ran very well to finish 2nd U13 girl in the accompanying 2K race. 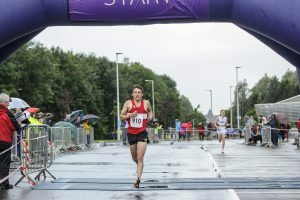 GB triathlete Grant has made the most of his enforced break from triathlete training involving swimming and cycling due to a broken wrist sustained in an ITU event in Canada in early August by concentrating more on his running and earning himself 2 Scottish senior gold medals over 5K on track and 10K on road. 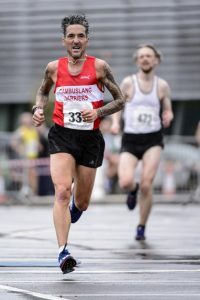 While he will do some running events over the winter season his main aim will be to gain triathlon selection for Scotland in next year’s Commonwealth Games. 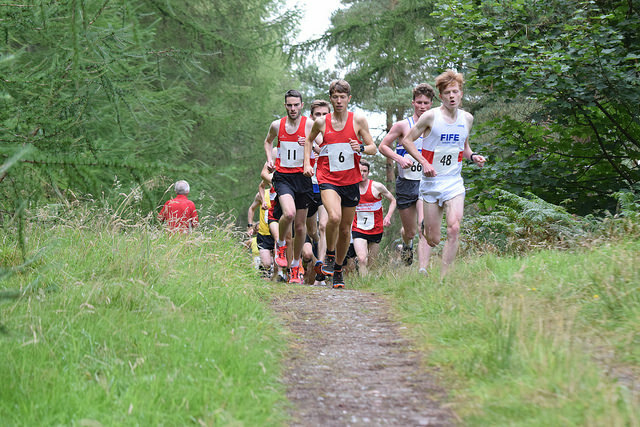 Members of Cambuslang Harriers had a very successful day at the Scottish Trail Race Championships held on Saturday 2nd September at the Falkland Estate in Fife. Conditions were warm and dry for the very undulating and testing course. 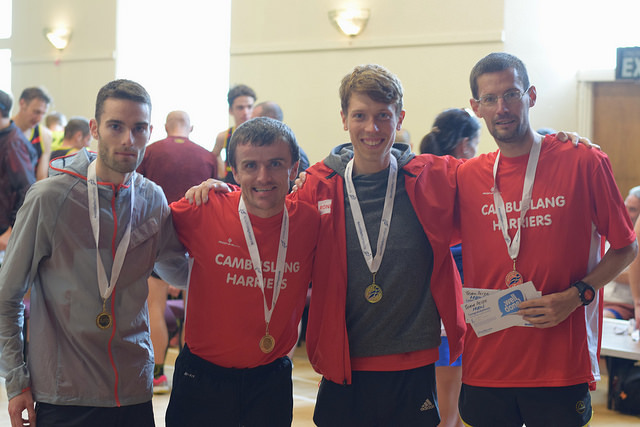 The senior/masters male quartet of Ben Hukins, Alasdair Campbell, Robert Gilroy and Kevan Harvey in 4th, 5th, 6th and 10th place packed well to claim victory from Inverness Harriers and HBT. The club maintained its monopoly of the men’s team title having now recorded 5 consecutive victories since the inception of this race in 2013. Robert lifting the O40 masters men title was a further boost for the club. Justin Carter who was next home for the club narrowly missed out on the O40 masters bronze medal. Michael Barker, Iain Nicholl, Simon Gold and Iain Crawford were next to finish. 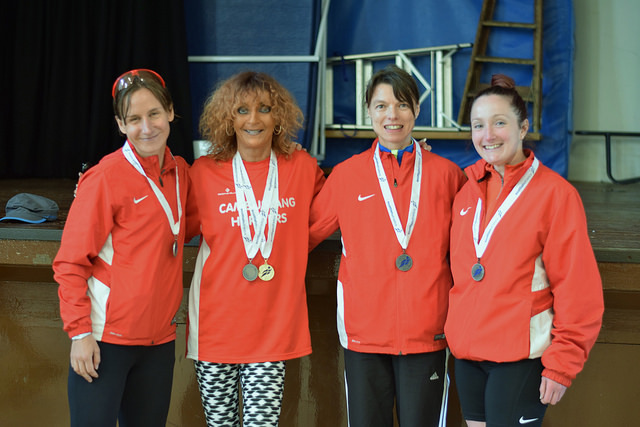 The senior and masters women competed in the same gruelling 10K race as the men and did the club proud by securing team bronze behind host club Fife AC and Garscube Harriers. Kirsty O’Brien, Jennifer Reid, Erica Christie and Lesley McArdle combined well to give the club its first Scottish senior/masters ladies team award in this event. There was further icing on the cake for Erica who was the first O60 lady to finish. Coach Lynn Angley provided back up support as our 5th finisher. Both Kevan and Lesley in their first year with the club picked up their first Scottish team medal as did Kirsty although she is no stranger to winning Scottish medals in duathlon and triathlon events. The U17 boys and girls added to the club’s overall haul of medals. 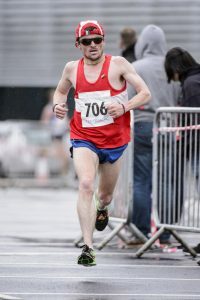 Drew Pollock who has had an excellent track season won his age group having led the 5K event from the front and with support from Keir Crawford and Andrew Carey the trio lifted the silver medals. The female trio of Holly Brock, Kelly McCutcheon and Ruth Kelly went one better to capture the gold medal. There was further medal success for the U15 boys who took team silver thanks to Aaron Grew, Michael Black and Zak Povey. Sean Friel and Robbie Woods followed in. 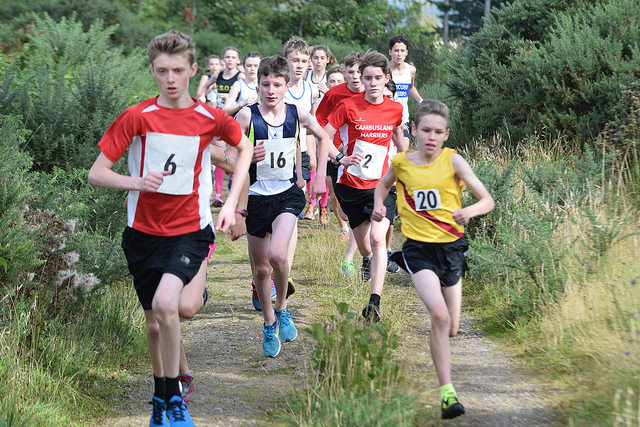 The U13 3K race for boys and girls was not a championship event but was designated as a development trail run. 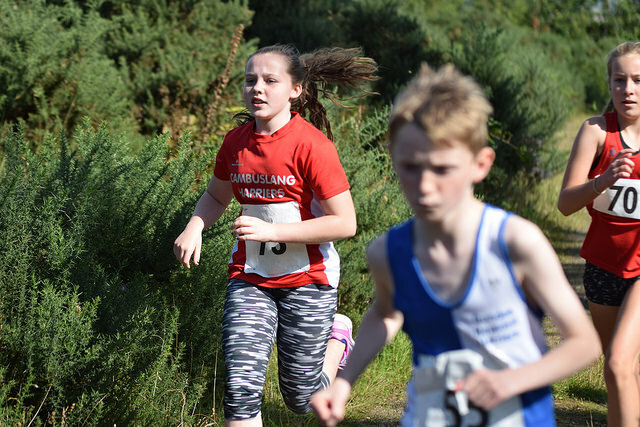 Fearghus MacGregor in 4th place led home team mates Lewis Roddis and Michael Byrne while Eva Ritchie in 6th position headed home Millie Nicholl, Eilidh Kennedy, Cara McDowall and Morvern Cameron. Given the unaccustomed warm weather and hilly nature of the course all our runners can be pleased with their efforts. Thanks also to our coaches and parents present on the day and to our ubiquitous photographer Colin Stephen for the encouraging support they all gave to our athletes and to Fife AC for organising the competition.